You will leave this workshop with practical insights and tools to enable you to more deliberately and effectively understand and manage your own and others’ emotions. This will improve your leadership capability and relationships, increase your influence, allow you to proactively build and maintain the mental toughness and resilience required for peak performance, detect when someone is becoming negatively impacted by stress, and diagnose and avoid the most common causes of personality clash and conflict. This workshop is facilitated by Dr Paul Wood. Paul is a high-energy and engaging facilitator who works with everyone from the Treasury to the Hurricanes. 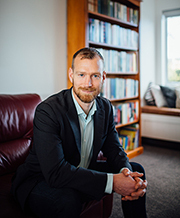 He is a regular contributor in the media and his TEDx presentation on his personal journey from delinquent to doctor of psychology has received more than 300,000 views on YouTube and was named one of the Top 10 TED talks by the New Zealand Herald. Paul specialises in assisting individuals and organisations reach and maintain peak performance and well-being. You can learn more about Dr Paul Wood at his coaching and consulting website: Switch Consulting Ltd.